Then we cleaned and I performed 5 haircuts during the time Jesus hung on the cross...very fitting! Good Saturday was a laid back day, and we very much felt like we were just waiting for His Resurrection. My dress was like the 17th one I tried on because NOTHING FITS RIGHT. Ugh. Anyway, I like it, it's hard to find a dress with sleeves and these sleeves are the focal point of the dress (sold out, but this one is similar, though I would never pay that price!)). The boys bright polos all came from Children's Place for super cheap and Maggie's dress was a hand-me-down from cousins. 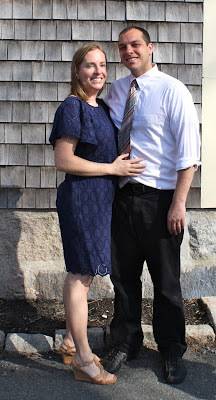 Linking up with Rosie for What I Wore Sunday. My Dad's brother, Tom, entered into eternal life this morning. What a blessing to die on Easter morning. Alleluia! Sneak shot of our Deacon, our pastor, and the head altar server all walking out of Mass. Mom and Dad...we exist! You wouldn't know it by all the following photos. Easter is a kid's holiday, for sure. We do a big family Easter basket, this year in a laundry basket, because I'm just not that together to do individual ones. Their futures are so bright. The family that glows together grows together. The illuminated mind makes the whole world sparkle. Ok, I'm out of neon fluorescent quotes. The Action Bible Devotional to go along with one of their favorite book from Easter's past, The Action Bible. Football Draft book and Basketball book for the big sports fans. A Sports Facts book for the little sports fans. A Ranger's Apprentice book to build our home series and a "girl book" from a new series to start. Super Wings Jett for the toddler and a Bath Toy for the baby. Patriots dress, Patriots hat, Patriots shirt and Big Boy Underwear (for the toddler in training). Some basketball foam indoor balls. We spent the rest of the day hanging out with family members and eating lots! The weather was warm and sunny, all the cousins played outside, and even the doggies in the family got along. Faith, family, friends, food, and fun. The perfect holiday combination. Happy Easter everyone, He is Risen!!!! Happy Easter! We totally have that lamb that prays! We love it! Prayers for the soul of your uncle. John Paul asked for the Action Bible so he's getting it in a few weeks for his first Communion - let me know how the kids like the devotional! And I love that dress - such a pretty fabric ❤❤❤ Happy Easter, Martins! I love your navy dress, Colleen! And you look tan, especially since it's only April!! That is a fantastic picture of the whole family! I am totally going to buy the boys those walkie talkies for their birthdays this summer! Happy Easter to the Martin family! My grandchildren had a fun egg hunt at our house. Plastic eggs only, no real colored eggs this year because apparently I am absent minded and peeled all two dozen eggs I had hard boiled. Sheesh! Everyone looks great Colleen. I love your dress. And I agree....it is SO hard to find a dress with sleeves. It drives me crazy. I'm sorry to hear about your uncle's passing. Prayers to your family during this time. Happy Easter! I highly recommend eShakti for dresses, though yours really is lovely. They have all sorts of classy and customizable styles and I've been really happy with them, especially with the sales they have pretty often! This is such a great set of pictures! I love the coordination of bright polo shirts, and your quotes! :-) I also enjoyed seeing the spoils of a family Easter basket - which, I thought was a fantastic idea! I will need to file that one away in the future... Looks like the day was absolutely stellar for your family. Happy Easter!